I love creating a space in my home that is truly me and makes me feel instantly “at home” when I walk into the room. I think your home is the perfect canvas to express yourself and make it your own. WallTalk is a Canadian company that can help you do just that. They are the leading manufacturer of decorative wall quotes and words and believe me the selection they offer is phenomenal. 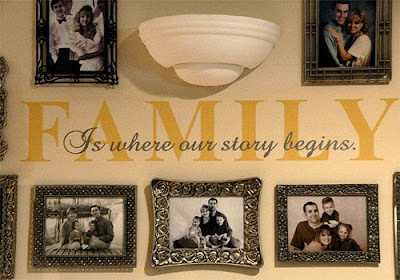 The WallTalk quotes and words are all pre-cut and pre-spaced letting that is both easy to apply and completely removable. All quotes measure 40 to 50 inches in length and come in various colours to suit your taste. They make all their products in Canada which is awesome! I fully support Canadian companies! There is something for every taste and they have many categories like Baby Talk and Lipstick Collection that you can browse through online. They have really good prices too! I received “Dream…a little dream each day.” from the Original Wall Talk Collection and I put this up in my bedroom. My bedroom was really blah before and I didn’t have much for decorations. On a sidenote, we had $25,000 worth of damage last year due to an ice dam so we still have completely redecorated. I wanted to choose a quote that flow with the bedroom as well as something that would make sense to go into that room. I figured something with Dream in it would be perfect. I love this quote and it kind of reminds me of that old song “Dream a Little Dream of Me”. My husband adn I decided to put it up over our bed since that space was sad looking and completely bare. It was so easy to apply! We just made sure it was straight on the wall and then rubbed a credit card over the letters to get them to transfer on the wall. We peeled back the paper and voila! We have our quote! I think the effect it had on the room was transformational and made it look much more inviting. I absolutely love it and now I want to get more to do other rooms in my house! The price for the quote that I received is $24.98. For that price, I would definitely be buying other quotes. You can purchase WallTalk from retailers across Canada and USA and you can check online to find the nearest to you. I just checked and they actually have three different retailers in Pembroke which is a small city near where I live. If there isn’t a retailer near you, you can still order from the WallTalk website. Overall I love WallTalk and can’t wait to get more quotes to transform the rest of my house!